The Federally Administered Tribal Areas (FATA; Pashto: قبایلي سیمې، منځنۍ پښتونخوا‎; Urdu: وفاقی منتظم شدہ قبائیلی علاقہ جات‎) is a semi-autonomous tribal region in northwestern Pakistan, consisting of seven tribal agencies (districts) and six frontier regions, and are directly governed by Pakistan's federal government through a special set of laws called the Frontier Crimes Regulations (FCR). It borders Pakistan's provinces of Khyber Pakhtunkhwa and Balochistan to the east and south, and Afghanistan's provinces of Kunar, Nangarhar, Paktia, Khost and Paktika to the west and north. The territory is almost exclusively inhabited by the Pashtun, who also live in the neighbouring provinces of Khyber Pakhtunkhwa and Northern Balochistan; they are largely Muslims. The main towns of the territory are Parachinar, Miramshah, Razmak, Wanna, Jamrud, and Landi Kotal. On March 2, 2017 the federal government approved the recommendations of the FATA reforms committee, which included the merger of the tribal areas with Khyber-Pakhtunkhwa and repeal of the Frontier Crimes Regulation (FCR). The process is expected to take five years to complete, concluding by 2022. The region was won from the Sikh Empire (which had annexed it during Ranjit Singh's rule) in the 19th century during the British colonial period. Although the British never succeeded in completely calming unrest in the region, it served as a buffer from unrest in Afghanistan. The British Raj attempted to control the population of the annexed tribal regions with the Frontier Crimes Regulations (FCR), which gave considerable power to govern to local nobles so long as these nobles were willing to meet the needs of the British. Due to the nobles placing unchecked discretionary power into the hands of the jirga, resulting in extensive human rights violations, the FCR has come to be known as the "black law." The annexed areas continued under the same governance after the independence of Pakistan in 1947, through the Dominion of Pakistan in 1947, and into the Islamic Republic of Pakistan in 1956. Even in the 1970s travellers through the Khyber Pass, such as those taking the Hippie Trail, were warned to stay close to the road because the Pakistani government had no control over the adjacent lands. According to the United States Institute of Peace, the character of the region underwent a shift beginning in the 1980s. Mujahideen entered to fight against the jirgas as allies of the CIA Operation Cyclone; both were opposed to forces of the Soviet Union prior to the fall of the Berlin Wall and collapse of Soviet Union. In 2001, the Tehrik-e-Taliban militants began entering into the region. In 2003, Taliban forces sheltered in the Federally Administered Tribal Areas began crossing the border into Afghanistan, attacking military and police after the United States invasion. Shkin, Afghanistan is a key location for these frequent battles. This heavily fortified military base has housed mostly American special operations forces since 2002 and is located six kilometers from the Pakistani border. It is considered the most dangerous location in Afghanistan. With the encouragement of the United States, 80,000 Pakistani troops entered the Federally Administered Tribal Areas in March 2004 to search for al-Qaeda operatives. They were met with fierce resistance from Pakistani Taliban. It was not the elders, but the Pakistani Taliban who negotiated a truce with the army, an indication of the extent to which the Pakistani Taliban had taken control. Troops entered the region, into South Waziristan and North Waziristan, eight more times between 2004 and 2006, and faced further Pakistani Taliban resistance. 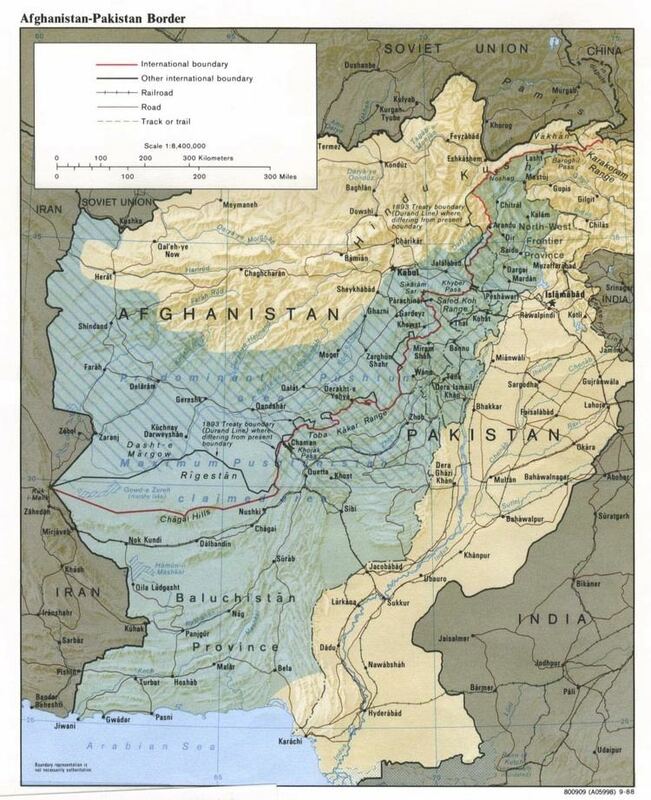 Peace accords entered into in 2004 and 2006 set terms whereby the tribesmen in the area would stop attacking Afghanistan, and the Pakistanis would halt major military actions against the Federally Administered Tribal Areas, release all prisoners, and permit tribesmen to carry small guns. 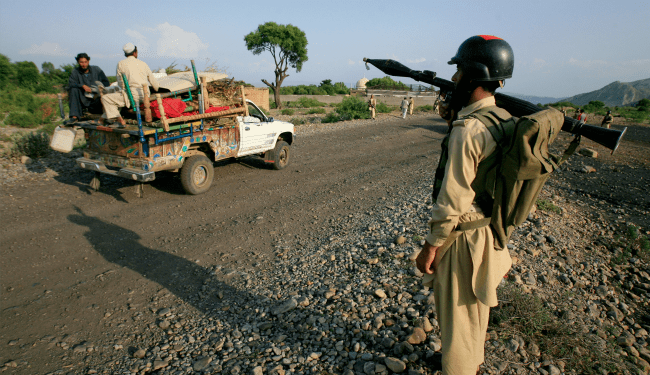 On 4 June 2007, the National Security Council of Pakistan met to decide the fate of Waziristan and take up a number of political and administrative decisions to control "Talibanization" of the area. The meeting was chaired by President Pervez Musharraf and it was attended by the Chief Ministers and Governors of all four provinces. They discussed the deteriorating law and order situation and the threat posed to state security. To crush the armed militancy in the Tribal regions and Khyber-Pakhtunkhwa, the government decided to intensify and reinforce law enforcement and military activity, take action against certain madrassahs, and jam illegal FM radio stations. 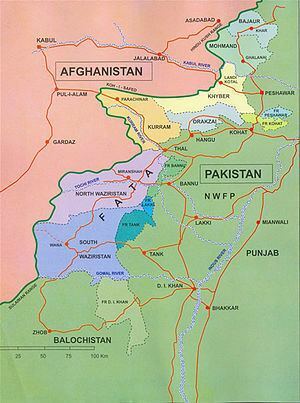 The Federally Administered Tribal Areas are bordered by: Afghanistan to the north and west with the border marked by the Durand Line, Khyber Pakhtunkhwa to the east, and Balochistan to the south. The seven Tribal Areas lie in a north-to-south strip that is adjacent to the west side of the six Frontier Regions, which also lie in a north-to-south strip. The areas within each of those two regions are geographically arranged in a sequence from north to south. The geographical arrangement of the seven Tribal Areas in order from north to south is: Bajaur, Mohmand, Khyber, Orakzai, Kurram, North Waziristan, South Waziristan. The geographical arrangement of the six Frontier Regions in order from north to south is: Peshawar, Kohat, Bannu, Lakki Marwat, Tank, Dera Ismail Khan. The total population of the Federally Administered Tribal Areas was estimated in 2000 to be about 3,341,080 people, or roughly 2% of Pakistan's population. Only 3.1% of the population resides in established townships. It is thus the most rural administrative unit in Pakistan. According to 2011 estimates FATA gained 62.1% population over its 1998 figures, totaling up to 4,452,913. This is the fourth-highest increase in population of any province, after that of Balochistan, Sindh and Gilgit-Baltistan. 99.1% of population speaks the Pashto language. In 1996, the government of Pakistan finally granted the Federally Administered Tribal Areas the long requested "adult franchise", under which every adult would have the right to vote for their own representatives in the Majlis-e-Shoora. The Federally Administered Tribal Areas were not allowed to organize political parties. Islamist candidates were able to campaign through mosques and madrassahs, as a result of which mullahs were elected to represent the Federally Administered Tribal Areas in the National Assembly in 1997 and 2002. This was a departure from prior tribal politics, where power was focused in the hands of secular authorities, Maliks. All of the FATA's adults were legally allowed to vote in the Majlis-e-Shoora of Pakistan under the "adult franchise" granted in 1996. Stephen Tierney, in Accommodating National Identity, reported that women came out to do so in the thousands for the 1997 office, possibly motivated by competition for voter numbers among the tribes. However, Ian Talbot in Pakistan, a Modern History states that elders and religious leaders attempted to prevent female participation by threatening punishment against tribesmen whose women registered, leading to under-registration in the female population. In 2008, the Taliban ordered women in the FATA regions of Bajaur, Kurram and Mohmand against voting under threat of "serious punishment," while Mangal Bagh, chief of the Lashkar-e-Islam, forbade women to vote in the Jamrud and Bara subdivisions of the Khyber Agency. The region is controlled by the Federal government of Pakistan. On behalf of the President, the Governor of Khyber Pakhtunkhwa (formerly NWFP) exercises the federal authority in the context of the Federally Administered Tribal Areas. The Constitution of Pakistan governs the FATA through the same rules which were framed by the British in 1901 as Frontier Crimes Regulations (FCR). The Jurisdiction of the Supreme Court and High Court of Pakistan does not extend to FATA and Provincially Administered Tribal Areas (PATA), according to Article 247 and Article 248, of existing 1973 Constitution of Pakistan. The Khyber-Pakhtunkhwa Provincial Assembly has no power in FATA, and can exercise its powers in PATA only for that which is part of Khyber-Pakhtunkhwa. The Pashtun tribes who inhabit the areas are semi-autonomous. Until the fall of the Taliban in neighbouring Afghanistan and the break out of warfare, the tribes had cordial relations with the Pakistan government. People of FATA are represented in the Parliament of Pakistan by their elected representatives both in National Assembly of Pakistan and the Senate of Pakistan. FATA has 12 members in the National Assembly and 8 members in the Senate. FATA has no representation in the Provincial Assembly of Khyber-Pakhtunkhwa. The administrative head of each tribal agency is the Political Agent who represents the President of Pakistan and the appointed Governor of Khyber-Pakhtunkhwa. Each Tribal Agency, depending on its size, has about two to three Assistant Political Agents, about three to ten Tehsildars, and a number of Naib Tehsildars with the requisite supporting staff. The FRs differ from the agencies only in the chain of command so that each FR is headed by the DC/DCO of the adjacent settled district (DC/DCO Peshawar heads FR Peshawar and so on). Under his supervision there is one Assistant Political Agent and a number of Tehsildars and Naib Tehsildars and support staff. Each Tribal Agency has roughly 2–3,000 Khasadars and levies force of irregulars and up to three to nine wings of the para-military Frontier Corps for maintenance of law and order in the Agency and borders security. The Frontier Corps Force is headed by Pakistan's regular army officers, and its soldiers are recruited mostly from the Pashtun tribes. The militancy situation has, however, improved after successive military operations carried out by Pakistan Army in Bajaur, Swat, Waziristan, Orakzai and Mohmand. In 2001 the Pakistani military entered the Federally Administered Tribal Areas for the first time which was previously governed by Frontier Corps. In 2010 The New America Foundation and Terror Free Tomorrow conducted the first comprehensive public opinion survey in the Federally Administered Tribal Areas. The results showed that, on the issue of fighting militancy in the region, the people of the Federally Administered Tribal Areas overwhelmingly support the Pakistani military. Nearly 70 percent back the Pakistani military pursuing Al-Qaeda and Taliban fighters in the Tribal Areas. According to a survey, when asked how the Federally Administered Tribal Areas should be governed, 79 percent said it should be governed by the Pakistani military. Parliamentarians from tribal areas have taken strong exception to a resolution adopted by the Khyber Pakhtunkhwa assembly asking for merger of the Federally Administered Tribal Areas with their province. The Awami National Party have also made similar demands that the FATA be merged with Khyber Pakhtunkhwa. These proposals have been opposed by tribal parliamentarians in Islamabad. 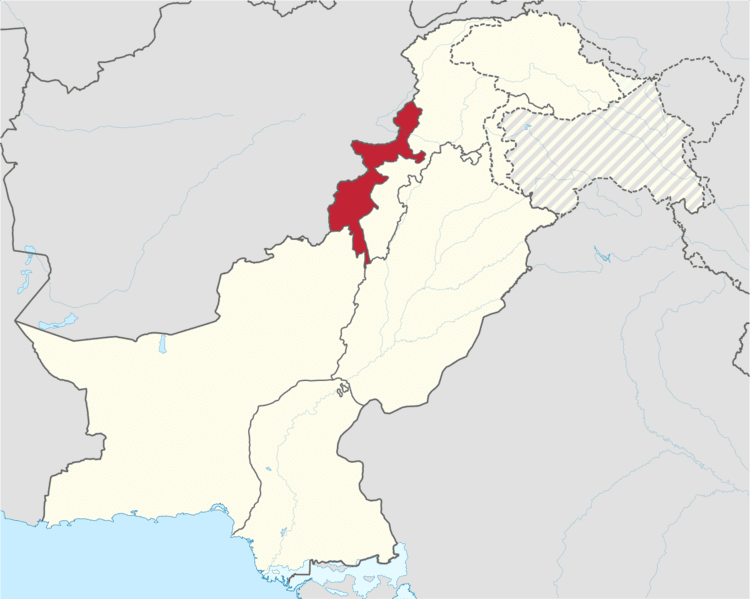 Should the Federally Administered Tribal Areas become a province of Pakistan, the name Qabailistan has been proposed. As of 24 January 2017, the federal government has decided to merge FATA with Khyber Pakhtunkhwa, for which required legislation would be managed in Parliament after approval from the federal cabinet. Prime Minister Nawaz Sharif will apprise the ministers of the issue of FATA with KP in the upcoming federal cabinet meeting. After approval for this merger, the Law Ministry would be asked to prepare the draft of the bill that would be presented in parliament for approval. The prime minister has taken the Jamiat Ulema-e-Islam (JUI-F) chief Maulana Fazl-ur-Rehman and other allies into confidence over the merger. The JUI-F was opposing this move on various political grounds. Under the plan, FATA would be put under the control of the provincial government through amendments to the Frontier Crimes Regulation (FCR). 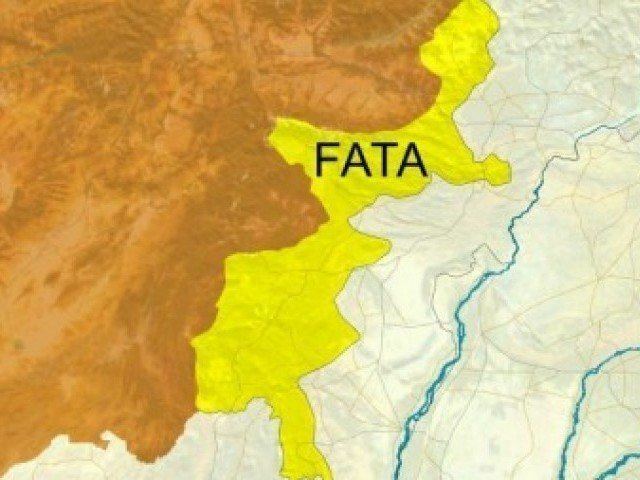 An annual grant of Rs100 billion has been proposed for FATA's development under the proposed merger and the amount will be given from the Federal Divisible Pool. Almost all the political parties support the demand of the merger of FATA with KP, including Pakistan Tehreek-e-Insaf (PTI), Awami National Party (ANP), Pakistan People's Party (PPP), Qaumi Watan Party (QWP) and Jamaat-e-Islami (JI). The FATA Reforms Committee also proposed last year a set of "parallel and concurrent" political, administrative, judicial and security reforms, as well as a massive reconstruction and rehabilitation programme, to prepare FATA for merger with Khyber Pakhtunkhwa. The proposed merger was almost finalized at a meeting presided over by President Mamnoon Hussain at the Presidency in January 2017. The Prime Minister has given approval after discussing the issue with all the stakeholders. As of the 3rd of March 2017, the federal cabinet approved the merger of FATA with Khyber Pakhtunkhwa and other reforms. The Federally Administered Tribal Areas(FATA) consist of two types of areas i.e. Tribal Agencies (Tribal Districts) and Frontier Regions (FRs). There are seven Tribal Agencies and six Frontier Regions. The Federally Administered Tribal Areas are the most impoverished part of the nation. Despite being home to 2.4% of Pakistan's population, it makes up only 1.5% of Pakistan's economy with a per capita income of only $663 in 2010 only 34% of households managed to rise above the poverty level. Due to the Federally Administered Tribal Areas' tribal organization, the economy is chiefly pastoral, with some agriculture practiced in the region's few fertile valleys. Its total irrigated land is roughly 1,000 square kilometres.. The region is a major center for opium trafficking, as well the smuggling of other contraband. Foreign aid to the region is a difficult proposition, according to Craig Cohen, an analyst at the Center for Strategic and International Studies in Washington, D.C. Since security is difficult, local nongovernmental organizations are required to distribute aid, but there is a lack of trust amongst NGOs and other powers that hampers distribution. 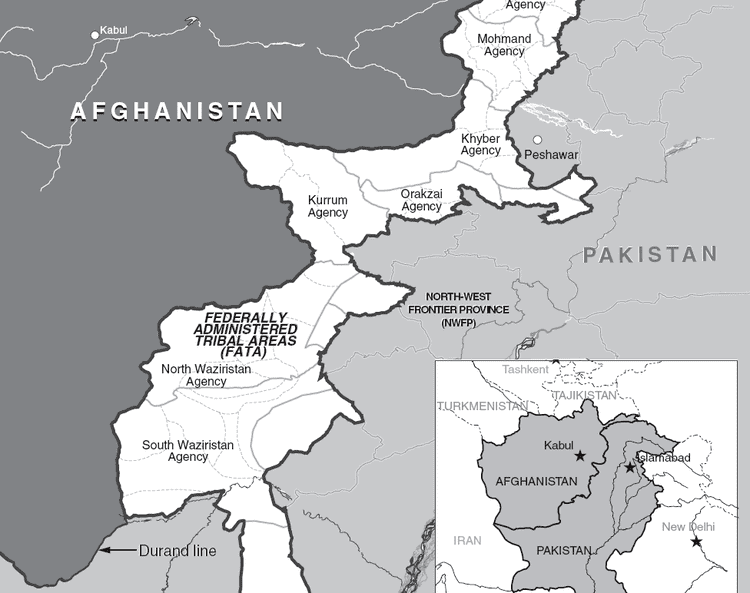 Pakistani NGOs are often targets of violent attacks by Islamist militants in the Federally Administered Tribal Areas. Due to the extensive hostility to any hint of foreign influence, the American branch of Save the Children was distributing funding anonymously in the region as of July 2007. The Federally Administered Tribal Areas contain proved commercially viable reserves of marble, copper, limestone and coal. However, in the current socio-political conditions, there is no chance of their exploitation in a profitable manner. Industrialization of the Federally Administered Tribal Areas is another route or remedy proposed for rapidly breaking up tribal barriers and promoting integration. The process of industrialization through a policy of public/private partnership would not only provide employment opportunities and economic benefits but also assist in bringing the youth of the tribal area on par with those of developed cities in the rest of the country. The concept of setting up ROZs in the Federally Administered Tribal Areas and Afghanistan is an element in the United States Government's counter-terrorism and regional economic integration strategies. Water is scarce in the Federally Administered Tribal Areas. When the British forces occupied Malakand they started work on the Amandara headworks to divert the Swat River through a tunnel to irrigate the plains of Mardan and Charsadda. The aim was not to get more wheat or sugarcane, but to ‘tame the wild tribes’. The Federally Administered Tribal Areas do not have a university, but seats are reserved for the Federally Administered Tribal Areas' students in Pakistani universities. There is no concrete plan to establish a full-fledged university within FATA. The Federally Administered Tribal Areas' literacy rate is 22%, which is well below the nationwide rate of 56%. 35.8% of men, and only 7.5% of women receive education, compared to a nationwide 44% of women. There is one hospital bed for every 2,179 people in the Federally Administered Tribal Areas, compared to one in 1,341 in Pakistan as a whole. There is one doctor for every 7,670 people compared to one doctor per 1,226 people in Pakistan as a whole. 43% of the Federally Administered Tribal Areas' citizens have access to clean drinking water. Much of the population is suspicious about modern medicine, and some militant groups are openly hostile to vaccinations. FATA has a total of 6,050 government education institutions out of which 4,868 are functional. Out of these 4,868 functional institutions, 77 percent (3,729) are primary schools. Total enrolment in government institutions is 612,556 out of which 69 percent are studying at primary stage. Total number of working teachers in FATA is 22,610 out of which 7,540 are female. The survival rate from Grade KG to Grade 5 is 36 percent while the transition rate from primary to middle in public schools in FATA is 64 percent (73 percent for boys and 45 percent for girls). FATA has produced some world-class sportspersons like cricketer Shahid Afridi from Khyber Agency and squash player Maria Toorpakay Wazir from South Waziristan who won the National Women’s Squash championship in 2010. FATA is home to the domestic cricket team FATA Cheetahs. The Federally Administered Tribal Areas cricket team gained first class status in 2015.